Can't attend? Follow Coffee and Brain Food Series to know of future events! In this age of high-speed Internet and cutting-edge devices, too many things are competing for a consumer's attention. This has given rise to countless abysmal declarations about our average attention spans by purported experts – some say it is less than 8 seconds, others say 12, and still others say 10. Then, there are others who reject these declarations, saying that we have longer attention spans than we are given credit! Regardless of whether we have 10-second attention spans, one thing is undeniable – too many things compete for a consumer's attention today, and so it has become much harder to engage and retain consumers to your product or service than before. But there's a set of methodologies not many people know about that can give you this edge in customer engagement and retention, and it's called Gamification. Gamification, as its name implies, emerged out of developments in the study of games design. Specifically, it is an adaptation of the games feedback loop – a set of extremely effective methodologies for ensuring gamer engagement and retention in video games – for situations outside of gaming. Come and join us on 13 April to find out what these methodologies are, and enjoy some good sandwiches and drinks! 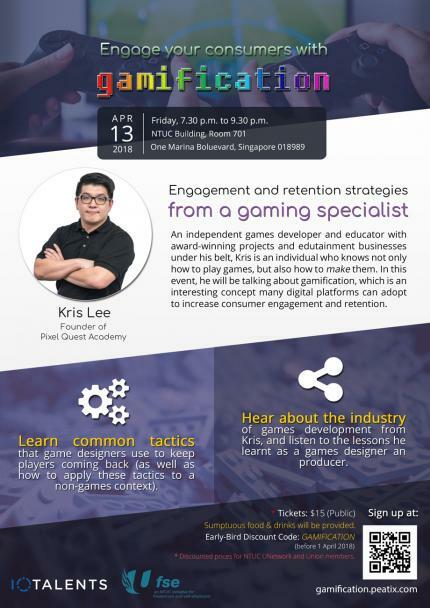 7.30 pm - 8.30 pm: Learn to Engage your consumers with Gamification! Use the code GAMIFICATION before 13 April 2018 to get a 33% early bird discount off Public tickets! Alternatively, sign up here to become a UNetwork member and become eligible to purchase tickets at a greatly-reduced price.